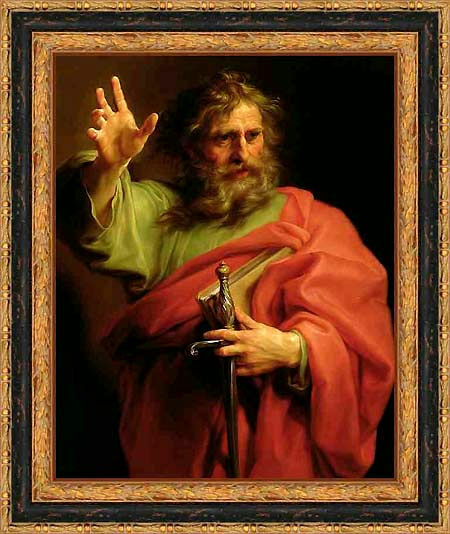 It is by no means surprising that the heads of the Christian church, have at all times held up St. Paul, as a man divinely inspired; have for a distinction entitled him, the Apostle, have inculcated for his writings the most profound veneration, and have caused them to be considered, as the oracles of the Holy Ghost. This Apostle was evidently the architect of the church. We may consider him especially as the founder of the ecclesiastical hierarchy. It is to him that are owing the prerogatives, privileges, divine rights and pretenses of the clergy. St. Paul established bishops, assigned them their rights, and in his writings laid the foundations of that spiritual power, which has since become so formidable to temporal authority. Nevertheless, if we read the gospels with the slightest attention, we shall find that Jesus has no where spoken of this hierarchy or power, nor of the prerogatives of the clergy; on the contrary, we see him' incessantly preaching to his apostles, equality, humility and poverty. These changes effected by Paul are sufficient to make us acquainted with his secret policy. He endeavored apparently to make himself the spiritual and temporal head of the churches, which he had by his labors, founded among the Gentiles, with whom, as we have shown, he had more success than among the Jews. It was to gain them over that he became all things to all men, that he dispensed them, as we have said, from the most essential ordinances of the Mosaic law. In short he had the secret of insinuating himself, into the minds of idolators, whom he sometimes took by surprise accommodating himself to their capacities, and giving them as he himself has said, sometimes milk, and at others, solid food. As we have already sufficiently shown, Paul after his successes with the Gentiles, gave himself little trouble respecting the converted Jews, or with his elder brethren in the apostle-ship; and openly declared himself against the Mosaic law. As we have seen be went himself to Jerusalem, to solicit a decree, to dispense the Gentiles from the rite of circumcision; this he had much at heart, feeling how necessary this indulgence was, in order to secure his new subjects. Thus it was he who enlarged the breach, though small in its origin, which separated the Jews from the Christians or Nazarenes. This conduct naturally displeased the rest of the apostles, who appeared, even after the council, always attached to the Jewish ordinances, but who on this occasion, found themselves compelled to cede to Paul, or at least to temporize with a man who had gained an ascendancy over them. On the other side, how can these prophecies made by Jews and addressed to Jews, serve as proofs of the doctrine of St. Paul, who had evidently formed the design of altering, or even of destroying, the Jewish religion, in order to raise a new system on its ruins? Such being the state of things, what real connection, or what relation, can there be between the religious system of the Jews, and that of St. Paul? The God that you preach is not the God of our fathers: you say that Christ is his son; but we know that God has no son. You pretend that this son, whom we have put to death as a false prophet, has risen from the dead, but Moses has not spoken of the resurrection; thus your new God and your dogmas are contrary to our law, and consequently we ought to hold them in abhorrence." In short these same Jews might have said to St. Paul: "You deceive yourself in saying, that you are the disciple of Jesus, your Jesus was a Jew, during the during the whole of his life he was circumcised, he conformed himself to all the legal ordinances; he often protested that he came to accomplish, and not to abolish the law; whilst you in contempt of the protestations of the Master, whose Apostle you say you are, take the liberty of changing this holy law, of decrying it, of dispensing with its most essential ordinances." Moreover the conversion of St. Paul strangely weakens the proof that the Christian religion draws from the miracles of Jesus Christ and his Apostles. According to the evangelists themselves the Jews were not at all convinced by these miracles. The Acts of the Apostles, adopted by the Ebionites or Nazarenes, relate amongst other things, that, "Paul was originally a Pagan, that he came to Jerusalem where he dwelt for some time; that being desirous of marrying the daughter of the High Priest he became a proselyte, and was circumcised; but not being able to obtain the woman he desired, he quarreled with the Jews, began to write against the circumcision, against the observation of the Sabbath, and against legal ordinances." Faustus, the Manichean, said on the subject of the gospels, "that they had been composed a long time after the Apostles, by some obscure individuals, who fearing that faith would not be given to histories of facts with which they must have been unacquainted, published under the name of the Apostles their own writings, so filled with mistakes and discordant relations and opinions, that we can find in them neither connection nor agreement with themselves." It is thus that the author of the Acts of the Apostles, only speaks, as it were, of his master, of St. Paul, and glances very slightly over the Acts of the Apostles of the contrary party. The same author (St. Luke) is presumed to have composed his gospel from the notes furnished him by St. Paul, though he had neither known nor seen Jesus Christ. It is in the Acts of the Apostles, and the Epistles of St. Paul, that we find the details of his life and the system of his doctrine; but, how can we be certain of the authenticity of these works, whilst we see many of the first Christians doubt and reject them as apocryphal? We find, in fact, that from the earliest period of the church, entire sects of Christians, who believed that many of the Epistles published under the name of this Apostle, were not really his. The Marcionites were confident that the gospels were filled with falsehood, and Marcion, their head, pretended that his gospel was the only true one. The Manicheans, who formed a very numerous sect at the commencement of Christianity, rejected as false, all the New Testament, and produced other writings, quite different, which they gave as authentic. The Corinthians, as well as the Marcionites, did not admit the Acts of the Apostles. The Encratites and the Severians did not adopt either the Acts or the Epistles of St. Paul. St. John Chrysostom in a homily, which he has made upon the Acts, says, that in his time (that is to say, towards the end of the fourth century) many men were ignorant not only of the name of the author, or of the collector of these Acts, but even did not know this work. The Valentinians, as well as many other sects of Christians accused our scriptures of being filled with errors, imperfections, and contradictions, and of being insufficient without the assistance of traditions; this is a fact that is attested to us by St. Irenæus. The Ebionites or Nazarenes, who, as we shall soon see, were the first Christians, rejected all the Epistles of St. Paul, and regarded him as an impostor and hypocrite. It is proper to remark in this place that these Ebionites, or first Christians, believed that Jesus was but a man, as much on the side of his father as on that of his mother, that is to say, the son of Joseph and Mary; but that he was a wise, just, and excellent person, thus meriting the appellation of the son of God, because of his holy life and good qualities whence we see that the first Christians were as well as the first Apostles, true Socinians. But St. Paul to give, without doubt, more luster to his ministry, and his adherents after him, willing to extol the holiness of their religion, made a God of Jesus, a dogma which it is no more permitted to doubt, especially since the partizans of Paul have become more numerous, and stronger than those of St. Peter and the other Nazarenes, or Jewish founders of primitive Christianity, which thus totally changed its face as to its capital dogmas. Papias, who was the master of St. Irenæus, was, in the opinion of Eusebius himself, a man of weak mind, a fabulous author, who had contributed to lead many men into error, and amongst others St. Irenæus who was his disciple, whom Eusebius regards as a very credulous man, though he was the first ecclesiastical historian of note. It is not surprising that those who have followed such guides have fallen into error. Is it possible to believe the traditions of such a man as St. Jerome, who in his life of St. Anthony, assures us that this holy man had a conference with satyrs with goats feet? Do we not justly doubt the sincerity of St. Augustine, when he says, "that he had seen a nation composed of men, who had eyes in the middle of their stomachs?" Are such authors more entitled to credit, than those of Robinson Crusoe, and of the Thousand and One Nights? Supposing even that at the commencement of Christianity, there had been authentic books in which the actions and the discourses of Jesus Christ and his Apostles had been faithfully related, should we be justified in supposing that they have been handed down to us such as they were originally? Prior to the invention of printing, it was doubtless much easier to impose upon the public than it is now, and notwithstanding, we see that the Press gives currency to innumerable falsehoods. The spirit of party causes every thing to be adopted that is useful to its own cause. That granted, how easy was it for the heads of the Church, who were once the only guardians of the holy books, either from pious fraud, or a determined wish to deceive, to insert falsehoods and articles of faith, in the books entrusted to their care. I have thus far shown that nothing was more destitute of proof than the authenticity of the books which contain the life and writings of St. Paul. I have shown that the Acts of the Apostles, and the Epistles of St. Paul, were rejected by some Christian sects which subsisted from the earliest times of the church. After what has been said, we ought naturally to regard St. Paul as the true founder of the pontifical see of Rome. Nevertheless certain traditions, useful to the Roman Pontiffs, oblige us to believe that it was St. Peter, who established his throne in the capital of the world; the popes have thought, that their interests required, that they should pass for the authorized successors of this Prince of the Apostles, to whom Christ himself according to the Gospel, granted immense rights and privileges. These traditions then make St. Peter travel to Rome, prior to St. Paul, and only regard the latter as the subaltern associate in the Apostolic labors of the former. Nevertheless some critics have ventured to doubt of the reality of St. Peter's voyage to Italy, and his foundation of the first see in the world, some authors otherwise very orthodox, without regarding the interests of the Pope, or respect for the traditions which favor them, have treated those pretensions as chimeras: as to the heretics, the sworn enemies of the authority of the Roman Pontiff, they have asserted, that the voyage of St. Peter to Rome was a fable invented by the supporters and partizans, with a design to exalt his authority. Secondly, St. Paul who was at Rome at the same time, that Peter was supposed to have been there, never once mentions this Prince of the Apostles, in the epistles to the faithful at different places, while he speaks to them of many other disciples of much less consideration than his illustrious colleague: we ought piously to suppose that if St. Peter had really established the faith at Rome, the Apostle of the Gentiles would have been too equitable to ravish from him the glory, that must have accrued to him from so fine a conquest. There is no mention made of the Holy Ghost in the Old Testament; there is mention made of the spirit of the Lord, which possessed, or resided in the prophets, and other holy personages charged with speaking to the Jewish people; but in no place of the Old Testament is the Holy Ghost announced as a being distinct from the Divinity, it is only in the New Testament that we find this metaphysical being deified, or this divine breath personified. In fact it is only in the history of Jesus Christ, that the Holy Ghost begins to perform, a part; we there find him commissioned to overshadow Mary, and produce the savior of the world, who was, as we are told, begotten by the operation of the Holy Ghost. Acts 9:3 – Jesus talks to Paul in vision. One of history’s “greatest” moments. Paul’s own books, his own words never mention the vision. Only his disciple Luke mentions it. Paul mentions it only in Letter to the Galatians 1:15 and says that God revealed unto him. He does not mention Jesus, or that it was on the road to Damascus, or give any details. When he was condemned to death by the Jews he fell back on his Roman citizenship and sailed for Rome under guard of Roman soldiers. He awaited his trial there, but was free to go about for 2 years. He saw many people, and preached openly. After this account we hear nothing more from the Bible. There is silence about the rest of his life and his death. There is no evidence that he was beheaded in Rome. He died 65 CE.